I’ve been dreaming of this pasta for a while. Even though we have had truffle oil in the States, Brad and I fell in love with it during our travels in Europe. They’re much more liberal with truffle oil there , but because we have to import the precious oil to the States pure truffle oil is very very expensive. Less expensive is truffle infused olive oil, which I used in this dish. This is a great substitute because truffle oil is very pungent so a little goes a long way. You’ll notice from the photos that even though oil was applied directly to the pasta, it doesn’t look the slightest bit oily and it’s not. Like I said, a little goes a long way. You can purchase truffle infused olive oil anywhere from the specialty olive oil shops that are popping up all over to the grocery store. I also used an herb blend from the local Savory Spice Shop. You can order this blend called, Capitol Hill Seasoning from their website if you don’t have a Savory Spice Shop near you, or you can try to replicate the blend of shallots, salt, pepper, dill weed, parsley and chives. I received this spice blend as a sample and I will definitely be back for more. It was a wonderful compliment to the flavors in this dish, as well as the crustless quiche I served at brunch that same morning. I can’t get enough of this stuff. 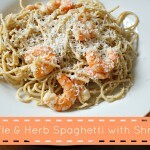 This dish was a big hit with my dinner guests. 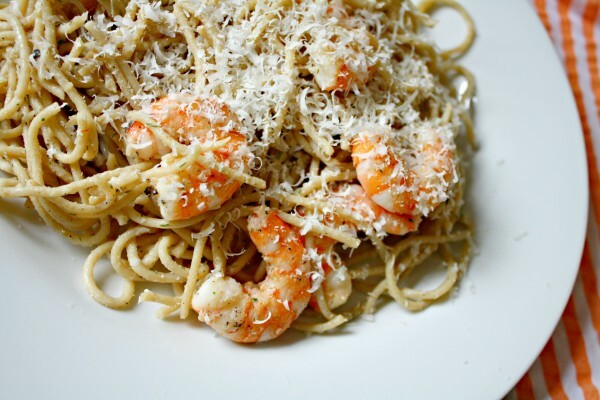 It reminded me of something that I would have had eaten on my honeymoon in Italy — simple and elegant. Those Italians know a thing or too about flavors and I’m happy that I had the chance to learn from them and incorporate some of their techniques into my own cooking. Fool your guests into thinking you're a gourmet cook with this elegant pasta dish that is in fact very easy to make. Boil whole wheat spaghetti according to package directions in water that has been well salted. Strain pasta reserving about 1/2 cup pasta water. Place pasta back in original pot and add pasta water back to pasta along with the oil, seasoning and cheese. Place lid over pot to keep warm. In a large pan or skillet, warm olive oil. 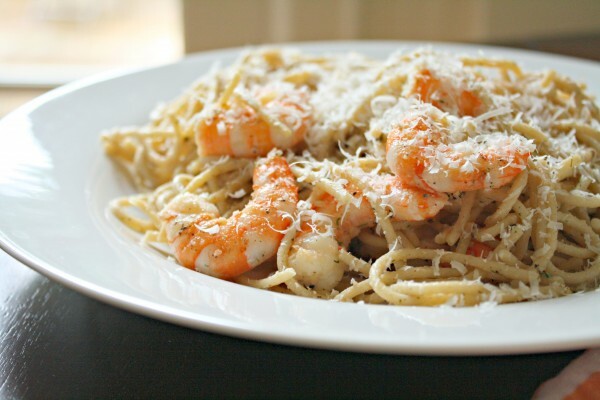 Place shrimp in pan so that no shrimp overlaps (do this in batches if necessary). Sprinkle evenly with salt and pepper. Allow to cook for about a minute or until the side touching the pan is pink. Flip each shrimp carefully and allow to cook for another minute or until shrimp is completely pink on both sides. Quickly remove from pan as to not overcook the shrimp. Add to pasta. Toss pasta to combine all ingredients evenly. Taste and add more salt and pepper as needed. Plate and garnish with additional parmesan cheese, if desired. This dish sounds delicious! 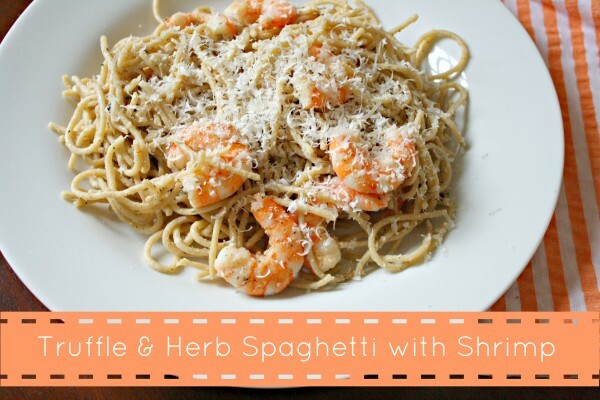 I recently fell victim to the buy 2, get 3 free sale Harris Teeter had on bags of frozen shrimp, so I have been looking for new ways to cook with it. I am curious if you bought your truffle infused oil at a regular grocery story or one of the specialty stores in town, and if you have a favorite brand. I have not cooked with it before, so I could use the extra tips. Brad bought ours at the Teeter, but I probably would have gone to one of the specialty shops like Pour Olive for a high quality oil. I love that you can taste it first there and they can give you lots of information on why their oil is better. Thank you! I was in Savory Spice Shop tonight and picked up some Capitol Hill seasoning. Now on to Pour Olive for the oil. Thanks again. Yay! So glad you found what you needed. If you’re looking for something else to do with the seasoning, it was wonderful in a crust-less quiche I made with parmesan and spinach. And as for the pasta, when in doubt, add more cheese. 🙂 Please let me know how it turns out!